We just spotted this nifty tool called the QuickTax RRSP Calculator which allows you to maximize your RRSP contributions. As the deadline is March 1st deadline for RRSP contributions. You can also get certain editions of Quicktax for Free here. 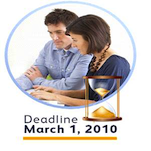 March 1, 2010 is this year’s deadline for your RRSP contributions. Maybe you’ve been contributing all year long by having it deducted from your pay check. Or perhaps you’ve never contributed to an RRSP, but would like to put some money towards an RRSP before the March 1, 2010 deadline. No matter what your RRSP situation is, QuickTax can help. Use the QuickTax FREE RRSP Calculator before March 1 and see how much money you should put into your RRSPs this year to get your biggest refund. There’s nothing more important than planning for your financial future, and QuickTax wants to help you turn those dreams into reality. In addition to the RRSP calculator, QuickTax has a wide range of products designed to help you maximize your refund and get the most out of your RRSP contributions for this year – and for years to come. RRSP stands for Registered Retirement Savings Plan, which is a special account designed for helping you save and invest towards your retirement. RRSPs are controlled by the Government of Canada, which means that they – and the people who contribute to them – are eligible for special tax benefits. Each year, you’re allowed to contribute up to a maximum amount to your RRSP. The Free QuickTax RRSP Calculator can help you determine how much you should put into your RRSP account, based on your income, where you live and tax rates. Why Should I Contribute To An RRSP? · Here’s an example: If you earned $70,000 this year, and contributed $5000 to an RRSP, you can deduct that $5000 from your taxable income. So you don’t have to pay any tax on that $5000. 2. Tax protection: As long as your RRSP sits in its account, it’s exempt from taxes. That means that its total value can quickly grow. · If you withdraw $5000 from your RRSP, that $5000 becomes taxable income. However, if you leave it in your RRSP, then it isn’t taxable, and it can continue to increase in value. 3. Peace of mind: Take comfort in knowing that you’ve protected yourself for the future and that should you ever need money now, your RRSP is there. · Picture your perfect retirement. Contributing to an RRSP early and often can help you reach your retirement goals with security and confidence. Contributing to an RRSP, and using its tax deductions to your advantage, is a simple way to save smartly today – while always keeping an eye towards the future you want. How Can QuickTax Help With My RRSP? In addition to the RRSP Calculator, QuickTax has a wide range of products featuring the QuickTax Toolbox – which is designed to help you maximize your income tax refund, and get the most from your RRSP account. Our products can handle any RRSP situation, and help you make the most of yours. Check out our suite of online tax software, and find the right one for you. Additionally, QuickTax products are available as a CD or through a software download. Take a look at our tax software catalogue to discover the right QuickTax product for your needs.